No.19 Oct & Nov issue was published. During this internship, eight students developed products and gave presentations to local engineers. Also they visited some famous universities and companies. The followings are feedback from participants. 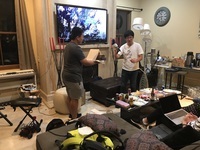 (Mr. Shunji Kanno, Ms. Sachiko Tajima, Mr. Yuya Hoshi) Since we didn't have so much time to develop our product, we made them at our hotel room at night. To obtain feedback from users, we went to downtown and asked the locals to play our product and took photos and movies. We were nervous, but it was very exciting experience! We felt fulfilled because they enjoyed our product. 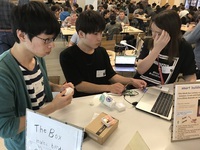 The products they made are exhibited in the contest GUGEN2018 (https://gugen.jp/) which is gateway to success to Makers. You can see their videos on the following site and try them at Aizu Geek Dojo! Please click " ほしいね！(I want it!)" if you love it!! The number of ほしいね！is one of the evaluation indexes to go the second selection. 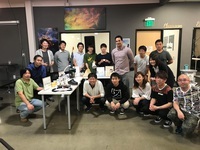 1) Microsoft: (Mr. Takahiro Yamauchi) I was nervous because we all never/barely had experienced presenting our own products to workers of Microsoft in English, but after the event, I gained more confidence. Listening to their advice helped us to improve our products. 2) Founder Base: (Mr. Shun Okawara) This is a share house opened for startup founder equipped good amenities. 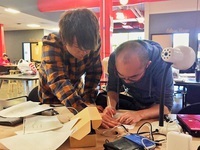 There are many opportunities to introduce own ideas and make conversations with other users. This was a valuable experience to exchange our mind with engineers and students of the same age. 3) Hacker Dojo: (Mr. Tatsuya Ona) Hacker Dojo is a good co-working space because we can know various people (hackers, entrepreneurs, artists, etc.) and learn the way of thinking in the field. (Mr. Tianshui Li) We gave a final presentation to make an ending for our two-week work here. Local engineers shared a lot of things with us such as daily life, experience, feeling, advice and so on! 1) Stanford Univ. and its d.school: (Ms. Sachiko Tajima) d.School is a place where people use for design thinking and develop their own creative potential. There is no one working on PC, instead of it, there is a lot of tools to create our idea. I think it is easier for team work to discuss and polish our idea by everyone. 2) HITACHI America: (Ms. Misaki Kozakai) A Japanese worker gave us a lecture about working style in USA. It was beyond my expectations. American style is freedom and gives priority to their families.